There’s a lot of people in California which can make it intimidating when it comes to applying for a school. No one wants that much competition! But since it’s still important to go to college, we’ve created a list of the best colleges in California to help you at least get started without fighting the crowd. Whether you’re just starting college or you really just need to finish what you started, online classes are a great way to go. They are flexible and can work around your schedule. You can watch lectures, finish homework assignments, and participate in online discussions on your own timetable. The founders of UC San Diego had one criterion for the campus: it must be distinctive. It started in 1903 as the Marine Biological Association of San Diego. Now it’s recognized as one of the top 15 research universities worldwide, doing everything to ensure its students have the opportunity to become changemakers, equipped with the tools needed to accelerate answers to the world’s most pressing issues. It has also been ranked as the 10th best Public School in the United States according to U.S. News & World Report. West Valley College offers exceptional preparation for transfer to a 4-year college or university. It has flexible course options including distance learning and more than 25 programs online. WVC also helped more than 750 students get their AA/AS degrees and more than 200 students earn certificates in the 2014-2015 school year. Humphreys University was founded in 1896 when it started as the Stockton Business College, Normal School, and Telegraphic Institute. Today it’s a non-profit, independent California institution of higher education with over 120 years of educational dedication. Its goal is to offer quality service and individualized attention for all students. At HU, more than 75 percent of classes have fewer than 20 students, offering students a chance to get the instruction they need. Patten University was founded in 1944 and is committed to mentor students and making a difference in the community. They are also committed to making education affordable so that students can earn a degree without the burden of debt. Their tuition model is a lump sum paid at the beginning of the term or monthly installments paid throughout the term. It requires students to take a minimum of 2 classes per term (4-month commitment), though you can take more. Each online course offered has a “preview” that helps students know what they can expect to learn from the course. Foothill College was founded in 1957 and officially opened its doors in 1961. Its purpose is to provide access to educational opportunity for all with innovation and distinction. Foothill is also part of the California Community Colleges Online Education Initiative Course Exchange, which allows students from other colleges (that are also part of the Course Exchange) to take courses from Foothill if they can’t take the same course at their own college. Fresno Pacific University was founded in 1944 as the Pacific Bible Institute by the Mennonite Brethren Church. It wasn’t until 1956 when the institute adopted a broader junior college curriculum to help boost declining enrollment. As a result, the institute was renamed Pacific College. FPU received full accreditation in 1965 as a four-year liberal arts institution, and in 1975 it was accredited to offer master’s degrees. At Fresno today, more than 80 percent of full-time faculty hold the highest degree in their field. It also holds the highest four-year graduation rate in the region. Shasta Bible College and Graduate School’s foundation dates back to 1970 when Dr. Royal D. Blue felt inspired to investigate the possibility of initiating an evening bible institute extension from Multnomah School of the Bible, utilizing the facilities of North Valley Baptist Church. It was officially known as Shasta Bible College in 1982, and today offers more than 25 online programs for students wishing for more education in Christian studies and other related coursework. National University was founded in 1971 and has since been striving to make lifelong learning opportunities accessible to everyone. This non-profit institution has more than 100 degree programs online and provides more online master’s degree programs in education to minority students than any other college or university online in California. Furthermore, it annually ranks in the Top 10 nationally in granting master’s degrees to women. Azusa Pacific University began on March 3, 1899, when a group of men and women gathered to form the Training School for Christian Workers. It became the first Bible college on the West Coast geared toward preparing men and women for ministry and service. Today it’s recognized annually as one of America’s Best Colleges by U.S. News & World Report. APU offers online classes to help adults best balance work, school, and family. DVC officially began in 1949 as East Contra Costa Junior College, its current name being adopted in 1958. Today it’s recognized as one of California’s best community colleges and it leads the state in student transfers to four-year institutions. Although DVC doesn’t officially offer a degree program 100 percent online, many degree programs can be completed solely online through careful planning and scheduling with your counselor. 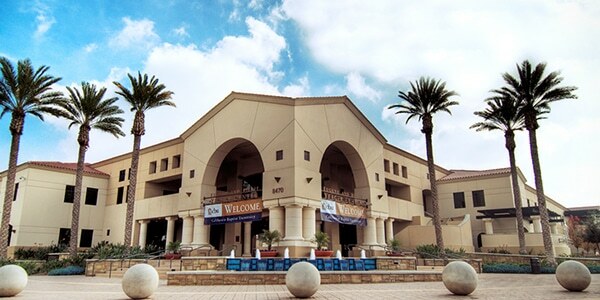 California Baptist University was founded in 1950 by the California Southern Baptist Convention and is one of the top private Christian colleges and universities in Southern California. One hundred percent of the staff at CBU is Christian, and it is considered a 2017 Best Regional University by U.S. News & World Report. It offers almost 40 bachelor, master, and doctoral degree programs online anywhere from a Bachelor’s in Public Health to a Doctorate of Business Administration. Although, it’s not online they offer a Bachelor of Science in Criminal Justice that will help prepare you for a thriving career in local, state or federal law enforcement. Pasadena City College was founded in 1929 as one of the first junior colleges in the southwest United States. Today it enrolls over 29,000 students each semester. It’s been ranked No. 1 in California for associate degrees granted, associate degrees for transfer, associate degrees earned by minorities, associate degrees earned by Asian Americans, and services to veterans. In 1929 the Academy of Art was founded by Richard S. Stephens, Art Director for Sunset Magazine, with his wife Clara in a rented loft with 45 students. The first Bachelor of Fine Arts degree program was offered to students in 1966. Today they have over 100 programs offered online (Including online bachelor programs), helping students reach their creative potential throughout the world. They even have pre-college classes to give high school students the opportunity to explore their creative interests in a fun and focused online environment. Through CSUEB Online and its East Bay location, Cal State East Bay offers nine bachelor-completion and master’s programs online. California is known as a tourist destination, which is perhaps why Cal State East Bay has distance programs designed for the hospitality and tourism field. Students can earn their bachelor’s in hospitality and tourism, recreation, and even a master’s in recreation and tourism through the school’s online program. However, these are not the only online programs available. Students are able to enroll in other online programs such as business, healthcare administration, human services, and education. A number of resources are available through Blackboard, such as 24/7 tech assistance, career counseling, and academic advising. One of the resources that will interest students the most is the ability to enroll in a payment plan, which allows students short on money to pay their tuition costs over time. Allan Hancock College was founded in 1920 as a public community college located in northern Santa Barbara County. It’s ranked as one of the five best community colleges in California and one of the top 120 community colleges in the nation. It started implementing online courses in 1998 and now has 24 programs offered online. Be sure to check the website or check with an advisor about which degree program can be completed exclusively online. LLU was first built as a hotel, and then was used as a sanitarium, and didn’t admit its first nursing students until 1905. Today it has emerged into a health-sciences university and medical center internationally known for advanced technology, service-oriented medical care, and education. If you are interested in taking any LLU online classes, be sure to check here and make sure you live in a qualifying state. Mount Saint Mary’s University is among the few online colleges in California to offer online programs for creative writing, gerontology, and a selection of liberal arts degrees. The university offers seven online programs, including majors in criminology, pre-health science, business administration, and computer sciences. The school also provides a master’s program for creative writing for those wanting a professional career writing novels, poetry, short stories, etc. The university also provides resources for its online students such as live chat, tech help, and access to bookstore and library tools. Students can enroll in online programs every eight weeks. With two college campuses, one in Santa Rosa and another in Petaluma, Santa Rosa Junior College serves more than 38,000 students. Established way back in 1918, Santa Rosa Junior College was designed to serve as the junior version of UC Berkeley. Awarding more than 5,400 degrees and certificates in 2016, offering more than 140 certificates, and dozens of transfer degree options, Santa Rosa Junior College aims to provide a quality education to its students as well as provide several public enrichment options. Students can also take advantage of the school’s Distance Education program in which they can choose to take fully-online classes, hybrid classes, and face-to-face courses blended with web-based materials. Cabrillo College was founded in in 1959, being called after Juan Rodriguez Cabrillo, a Portuguese ship pilot who led the first European expedition to explore the uncharted coast of California in 1542. Cabrillo College’s first classes were held in temporary quarters within the partially abandoned old Watsonville High School. Today Cabrillo offers associate degree program and certificates in more than 70 fields of study and has reached record enrollment of more than 17,000 students. CSUF is among the top college destinations in the United States for community college transfers. It’s also ranked fifth in the nation in terms of bachelor’s degrees awarded to underrepresented students, based on data from the U.S. Department of Education. On top of that, it’s been ranked No. 1 in California and second in the nation among top colleges and universities awarding degrees to Hispanics, based on data from the U.S. Department of Education. Founded in 1976, Coastline offers you the small-college feel with the big-college benefits. Unlike most colleges, it doesn’t have a traditional campus but instead has Instructional Centers throughout the Coast Community College District. Today, Coastline’s mission is to deliver flexible courses and services that guide students to the attainment of associate degrees, certificates, career readiness, and transfer to four-year colleges or universities. The University of San Francisco‘s online education program only offers master’s degrees online. If you are a prospective student, there are four programs for you to choose from: Master of Science in Nursing, Master of Public Health, Master of Science in Healthcare Simulation, and Master of Public Administration. Students can enroll in these online programs during the spring, summer, and fall semesters. The University of San Francisco ensures that its online students receive personalized attention from their instructors by keeping the class sizes small in their virtual classrooms. No matter where you live, tuition rates are the same for all online students. Most degree options can be completed in 13 months and don’t need GRE scores for admission. The university also offers resources for its online students such as career advising, a writing center, academic and psychological counseling services, and electronic access to the Gleeson Library and Geschke Center. Located in two campuses, one in Fremont and one in Newark, Ohlone College has affordable tuition and quality accreditation standards for its growing student population. Ohlone College offers three different types of online learning through their eCampus: web-enhanced classes, hybrid classes, and fully online classes. They are all taught through the Canvas course management software. Students who take online classes will have weekly assignments, quizzes, and discussions and are not required to attend either of the college’s campuses. Online students have access to a number of resources, such as a digital library and online academic advising. Located in Oceanside, MiraCosta College offers a number of fully online and hybrid classes. MiraCosta College offers associate degrees and career certification courses in such areas as the health sciences, information technology, and business. The school also offers a series of medical and technical online programs. Students can sign up for the medical transcription with editing online program, which is composed of 640 hours of course material. MiraCosta college also offers online programs for professional medical coding and billing, which takes 565 hours to complete, as well as the pharmacy technician program, which takes 285 hours to complete. Technical online programs like robotics technician and electromechanical technician are also available. GGU can trace its origins to an evening lecture series started by the San Francisco YMCA during the California gold rush in the early 1850s. The first degree-conferring program of the university started in 1901, and in 1996 GGU started one of the country’s first web-based learning programs. It is ranked as America’s No. 1 School for Adult Learners by the Washington Monthly. It has a demo class for students who wish to take classes online but are unfamiliar with the online learning format. Brandman University was established in 1958 by Chapman University – a private institution in Orange, California. Its original purpose was delivering high-quality education to the El Toro Marine Corps Air Station. It eventually became its own university and, though still military friendly, expanded its programs to include all adult learners. Brandman has been honored nine times for educational excellence in bachelor’s programs as well as the master’s programs in business and education. It’s been ranked as one of the leading U.S. public and private educational institutions included among the 2017 Best Online Programs ranked by U.S. News & World Report. The Best Online ranking has been in existence for six years and Brandman has earned top rankings each year. Sac State is California’s capital university, providing world-class, affordable education in the political, cultural, and economic heart of the Golden State. It is dedicated to the belief that there are no limits to its students’ potential for excellence and success. Sac State is the seventh most diverse university in the western United States, and only 42 percent of undergraduates reported graduating with debt in 2013 compared to the national average of 69 percent. Founded as Pacific Bible Seminary in 1928, Hope International University is a private Christian university affiliated with non-denominational Christian Churches/Churches of Christ. The university offers five online programs for undergraduate students: Online Associate of Arts, Bachelor of Arts in Liberal Studies: Teacher Preparation, Bachelor of Science in Business Administration, Bachelor of Science in Human Development, and Bachelor of Science in Christian Ministry. Graduate students also have access to online learning. Hope International University students can take advantage of the multiple resources the school has available for online students, such as access to a live chat option for academic coaching before they enroll for classes. Coursework is fully integrated with Canvas and the school’s social media accounts so students can still feel a part of the college community even if they’re fully online. They have two campuses in California (Anaheim and Fullerton) and one in Washington state and Nebraska. BCC is a comprehensive two-year institution that serves a diverse student population in the Mojave region of San Bernardino County. It was established in 1959 and serves a large area from the Nevada border on the east to Kern County on the west. This institution also maintains a satellite learning center at the U.S. Army National Training Center in Ft. Irwin, California, which serves military personnel and their families. Situated in the Sierra foothills of Sonora, Columbia College offers a supportive and engaging learning environment to its students. Their aim is to help their students become inquisitive, creative, and thoughtful in addition to preparing them for their chosen career path. Columbia College uses the Canvas system to offer its students a number of online classes, whether they be fully online or hybrid, to allow all students the ability to reach their academic goals. They have also been part of the Online Education Initiative (OEI). The purpose of the OEI is to create an Online Course Exchange that presents the students with a seamless online experience. West Hills College is committed to the relentless pursuit of student success. It’s served the west side of the San Joaquin Valley for more than 80 years after being founded in 1932 as an extension center for Fresno State College. It started offering online colleges in 1999 and received full accreditation in 2005, becoming the 109th community college in California. Touro University Worldwide (TUW) is a non-profit university, accredited by the WASC Senior College and University Commission, and is part of the Touro College and University System. The online degree programs at TUW range from the undergraduate level to the doctoral level. TUW has developed its unique model designed to offer supportive high-quality education and improve student success. TUW has extremely affordable tuition and a university-wide scholarship program focused on student retention and graduation making the student cost of learning and attaining a degree well below most comparable institutions. A complete online library and resources included in the tuition with no student expenses on textbooks. All courses are offered six times a year resulting in a clear and supportive path to the successful completion of degree programs. Originally established in 1868 as the Convent of Our Lady of the Sacred Heart by six members of the Roman Catholic teaching order the Sisters of the Holy Names Holy Names University, Holy Names University is known to rank among other schools in “best value” lists across the country. The university has one of the most diverse campuses on the West Coast and most of the faculty hold the highest degree in their fields. Holy Names University offers only one online program: Master of Science in Nursing. This graduate nursing program prepares nurses with all levels of experience to advance in their chosen field. With the exception of their ADN to MSN program, all Master of Science in Nursing degrees can be completed in two years. Hybrid classes meet one weekend out of the month and spend the rest of the time online.The school also provides a state-of-the-art Nursing Simulation Center for students who desire hands-on training. The University of California Irvine is considered one of the top colleges in California for low-income students. The university is also one of California’s top-rated public universities, with a particular renown in the field of chemistry. The school has adopted online classes for its summer terms. Depending on the specific class, it will take between five and ten weeks to complete each online course. If you want to attend a top-level university but can’t commute to campus, UC Irvine just might be the option you’re looking for. De Anza College is one of the top schools in the area when it comes to graduation and transfer rates. This community college also boasts an excellent animation program that is often compared with those from bigger universities like UCLA, NYU, and USC as far as quality is concerned. De Anza College is also home to a very diverse student population and, as mentioned, high transfer rates to California State schools and Univesity of California schools. The college’s Online Education Center provides resources for students who are taking at least one form of online classes at the school: full online courses, hybrid courses, or face-to-face courses that use the school’s Course Management System. They offer a number of lower-division online classes for those students that need flexibility in their schedule. The classes are academically equivalent to their on-campus counterparts and many meet both general education and transfer requirements for California public institutions. If you’re interested in obtaining an associate degree in organizational leadership or psychology online, then Simpson University may be what you’re looking for. Simpson University uses a cohort model for their online programs, which means that each student works through the class material as a group throughout the program. The school uses Moodle as their Learning Management System and students and faculty are expected to use Skype to communicate. Classes last five weeks, during which students are expected to complete weekly assignments and group projects. Simpson University offers comprehensive degree programs that are also time-intensive which can be completed in about 16 months. Both programs require completion of 12 courses and a capstone project. The Rio Hondo community college district was established by a vote in 1960 but opened its doors in 1963 for instruction. It offers many strong career-technical programs such as a bachelor in nursing, fire and police academies, automotive and alternative fuels, a full transfer curriculum, and basic skills courses and services. It enrolls approximately 20,000 students per semester and has a very diverse student population. Humboldt is a public institution that was founded as a teacher’s college in 1913. It’s part of the 23-campus California State University system, located 275 miles north of San Francisco in the town of Arcata, which is recognized as one of the West’s best college towns. It’s been ranked as a Top Western University by U.S. News & World Report and was included in the G.I. Jobs magazine as a military friendly school. San Jose State University offers a number of online degree options and certificate programs. They have four fully-online degree programs: Master of Science in Criminology (with a concentration in Global Criminology), Master of Archives and Records Administration, Master of Library and Information Science, and Doctor of Nursing Practice. They have five hybrid programs: Master of Science in Software Engineering, Master of Social Work, Master of Public Health, Master of Arts in Music Education, and Master of Science in Medical Product Development Management. They also offer a number of fully-online professional certificate programs. Founded in 1929 as a department of Antelope Valley Joint Union High School, Antelope Valley College now services more than 18,000 students and employs more than 850 people. Fully accredited by the ACCJC/WASC, Antelope Valley College aims to provide a valuable education for its students and opportunities for all members of their community. One of the ways they do that is by providing access to online classes to members of the community. They have partnered with Ed2Go to provide these not-for-credit classes at low prices. However, if you’re looking for online classes that will help you complete your degree, look no further than their Distance Education program. Antelope Valley College provides a number of resources and for-credit classes for their online students in the areas of biology, business, history, film and television, sociology, and so on. Located in the Los Angeles neighborhood that shares its namesake, California State University Northridge offers professional certificates as well as 13 fully online degrees, some through the Tseng College for graduate, international, and midcareer education. Even though their online programs are primarily focused on public administration, they have a range of options available in social work, humanities, and others. Students can choose from a number of diverse concentrations in various sectors of public administration if intending to obtain an online bachelor’s or master’s degree. Professional certification online can be obtained by students through the many health programs available with emphases in speech-language pathology, CT and MRI technology, and speech-language pathology fieldwork. CSU Northridge has some of the best online programs in California and is one of the largest single-campus universities in the country. Based in sunny Orange County, Orange Coast College is close to two great attractions: Disneyland and beautiful beaches. In other words, this college is perfect for the student who wants to enjoy their time in the OC. Beautiful sights are not the only thing Orange Coast College can boast about. The college offers a variety of two-year degrees and one of the highest rankings when it comes to transferring to four-year state universities. All Orange Coast College classes have an online component. Whether you sign up for a class that is 50% or 100% online is up to you. Orange Coast College uses Canvas to keep track of all online work. How often students use the program depends on their specific teachers, just keep in mind that it will generally be about the same amount of work as an on-campus class. The point of online classes is not to create easier classes, just to have an option for those students that can’t travel to campus for numerous reasons. Located in a suburb of the greater Los Angeles area, Mt. San Antonio College is one of the more popular community colleges due to its location. Known as having one of the biggest campuses in the state, Mt. San Antonio College is continually growing in both size and student population. Most online programs offered at Mt. San Antonio College are related to the technology field. Their online programs are fully online and students can graduate with a professional certificate in the following fields: operating systems security, telecommunications, networking, programming, visual basic, hospitality management, and restaurant management. They also offer hybrid classes through their Distance Learning program. Graduation from the school’s online certificate programs requires the completion of 12 to 21 credits. Even though California State University Monterey Bay offers only one online degree, it’s one of the best of its kind. The CS Online degree completion offers a unique mix of hands-on information technology practice and computer science theory. Completing CSU Monterey Bay’s computer science program will help students find jobs such as software engineers, mobile app developers, and technology project managers, as well as other careers in the information technology and computer science fields. Based in San Bernardino, this branch of California State University offers a variety of programs and certificates through its College of Extended Learning (CEL). The CEL provides continuing educational courses to professionals in addition to serving high school students who are preparing for post-secondary education by enrolling in distance coursework. Students in the education program have to take Virtual Education Software courses. The courses are accessed through Blackboard and are written by top educators who are there to provide feedback and instruction. Online support is also available for troubleshooting, live chat, and other issues students may run into. Distance students have access to interactive calendars, career counseling services, course schedules, and an electronic library. California State University Dominguez Hills is a diverse college that aims to provide its students with a high-quality, affordable education. Located in the South Bay and heart of Los Angeles, CSU Dominguez Hills has dedicated faculty mentors, strong academic programs, and a supportive staff all with the purpose of assisting students in achieving their career goals. Their distance learning program offers nine degree options to choose from, as well as multiple certificate programs. There are three bachelor programs: Bachelor of Science Applied Studies, Bachelor of Science Nursing, and Bachelor of Science Quality Assurance. They have six master programs to choose from: Master of Arts Humanities, Master of Business Administration, Master of Public Administration, Master of Science Nursing, Master of Science Quality Assurance, and Master of Arts Negotiation, Conflict Resolution and Peacebuilding. Through their Distance Education program, East Los Angeles College provides students with a number of comprehensive services meant to help both faculty and students achieve success in their online courses. All online classes are offered through Canvas, the school’s Learning Management System. Through Canvas, students have access to their syllabus, course materials, class discussions, student collaboration, quizzes, exams, and the ability to turn in their assignments. Keep in mind that even though the school offers fully online classes, some will require students to take their exams on campus. The school also offers hybrid courses, where students meet their instructors and classmates on campus like traditional classes, but some of the work will be done via the Canvas system. Formed in 1962 by a vote of the citizens in Banning, Beaumont, Hemet and San Jacinto, Mt. San Jacinto College is part of the California Community College system and has five campuses: San Jacinto Campus, Menifee Valley Campus, San Gorgonio Pass Campus, Temecula Education Complex, and Temecula Higher Education Complex. They hold a number of classes at satellite locations in addition to offering many courses online. Mt. San Jacinto College has five points as their Online Program Mission: Provide a high-quality learning experience in every course, deliver regular effective contact from instructors, offer over 100 different courses (including over 450 sections), online courses delivered via Canvas Learning Management System, and access to integrated email system using Microsoft Office 365. Los Angeles Southwest College offers a number of services for students who plan to become online students. Los Angeles Southwest College, along with other colleges in the Los Angeles Community College District, began offering online classes as early as 2007. LA Southwest College believes in reaching out and educating the community at large through both traditional and non-traditional forums. All online classes, whether they be fully online or hybrid, are conducted through Canvas, the school’s Learning Management System. Students are expected to complete the same amount of work as they would if they were taking a traditional class. There are no set times for class meetings, so it is up to the student to plan when to log in to Canvas and complete the work in a timely manner. The school offers a number of classes online, such as history, political science, and Spanish. Established in 1947, Palo Verde College has served southeastern California students for over 70 years. Palo Verde College provides great programs and services for its student population, all with the aim of creating a dedicated and effective learning environment. Life is busy and Palo Verde College understands this, which is why it provides Distance Learning for its students so they can learn and graduate with a degree in their own time. Palo Verde College’s Distance Learning includes three different methods of education: Bridge Classes, Correspondence Education Courses, and Televised Courses. Bridge Classes are online courses students can take if they can’t physically attend school. Access to e-mail and the internet is required as that is how assignments will be delivered and turned in. Correspondence Education Courses means that the college will provide you with instructional materials, including exams, by either mail or electronic transmission when a campus-based alternative is impractical. Televised Courses offer interactive television instruction to students living in either the Blythe or Needles region and can originate in either campus, televising in real-time to the other campus. Established in 1925 as the Frank Wiggins Trade School, Los Angeles Trade Technical College is the oldest of the nine two-year public colleges in the Los Angeles Community College District. Providing opportunities for students who can’t attend a traditional college environment, Los Angeles Trade-Tech offers a number of courses that can be completed online. The school uses Moodle and Canvas for their online learning systems. They also provide online tutoring through NetTutor, which can be accessed through the students’ Moodle and Canvas accounts. Whether it’s English, sociology, or film classes, Los Angeles Trade-Tech has various online classes for you to choose from. The University of Southern California has been striving to uplift the arts, music, and theater to perform for the surrounding community. Enrolling nearly 50,000 students, USC is recognized for its outstanding academics, arts, and athletics. USC offers global services and research opportunities in 50 countries. San Diego State University is one of the largest universities in California and is highly regarded for its contributions t minority education. SDSU was founded in 1897 with only 91 students and now enrolls over 36,000 students. SDSU offers over 190 different academic programs, over 30 of which are offered completely online. This list of best online colleges in California is ranked by a number of factors, including the ratio of students to teachers, graduation rate, tuition cost, and thenumber of online programs. We know that finding the best school to fit your unique needs is a huge challenge. For that reason, we work hard to develop lists of the best online universities based on the characteristics most important for you for your higher education. Whether that be the cost of attendance, student success, resources available, flexibility of schedule, or any other number of important factors, we’ve got you covered. For more information about our ranking process and to find lists of schools based on specific characteristics, check out our methodology page.